When I first came to the U.S., I was a bright-eyed 19-year-old with a suitcase and a thirst for exploration. The first few months of my life in Philadelphia as a freshman in college seem like a dream today. I was discovering so many cool and interesting things that I had never experienced before: Roller coasters; The Awesome Blossom deep fried onion at Chili’s; and heat. Not the radiator kind but the pepper one. At the age of 19, I was so unaccustomed to hot food that ground black pepper was too hot for me. But it didn’t take me long to figure out that I liked heat and that with a little practice I could tolerate hot sauces and peppers. Today I relish them. 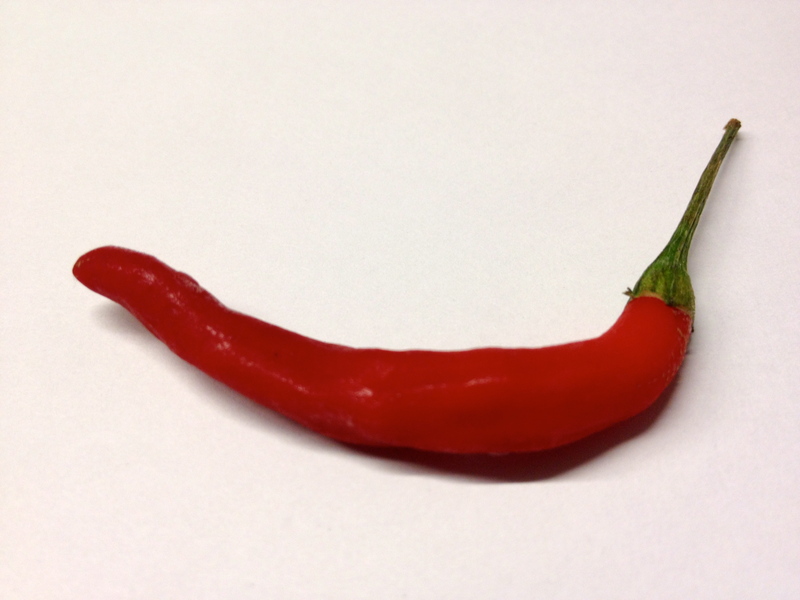 My favorite hot pepper is the Thai red pepper. Not only because of its fruity, pleasant taste but also because of where its heat hits you. It’s concentrated at the very front of your mouth and the lips. After eating something with Thai red peppers in it, your lips prickle and buzz, like the aftermath of an extraordinary first kiss. 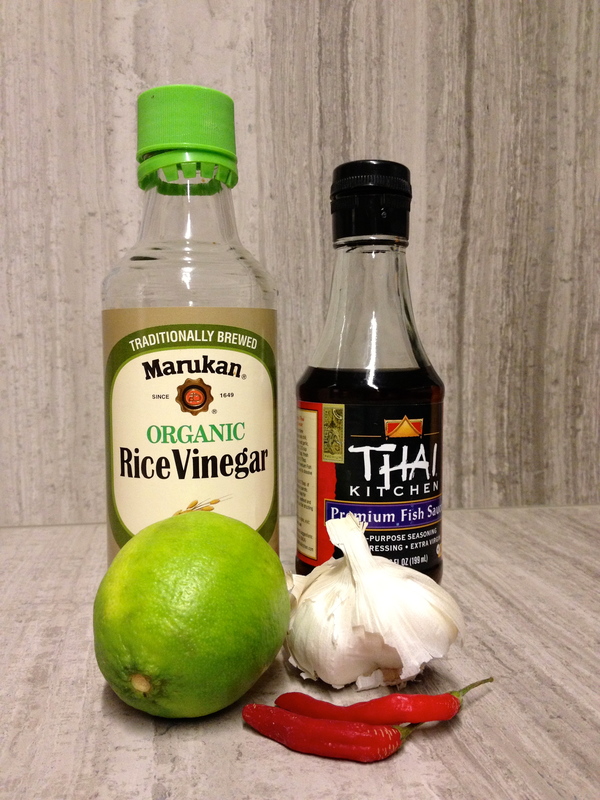 This recipe is for a very basic vinaigrette that is in fact a common table condiment in Thailand called Nam-Pla Prik. 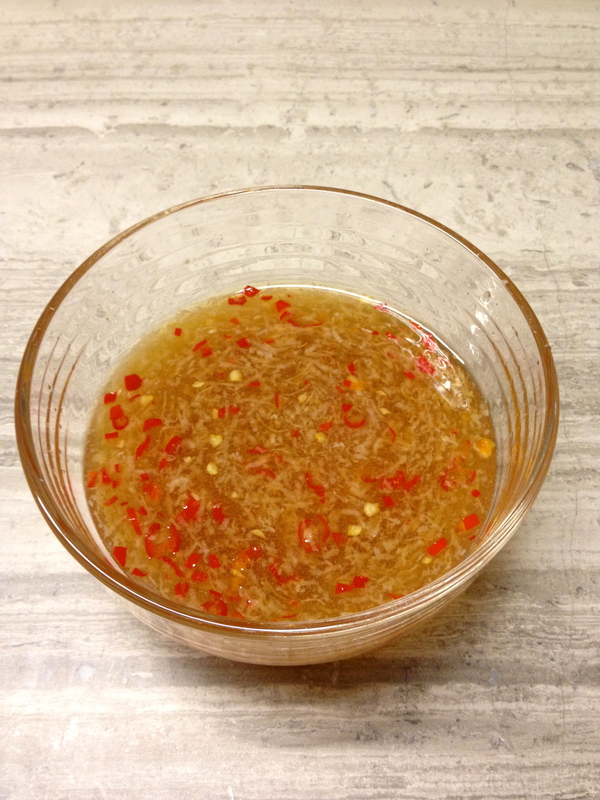 It’s easy to make and it has the characteristic flavor combinations of Thai food: heat, salt, sweet, sour, and umami. It’s absolutely delicious tossed with roasted vegetables (like brussel sprouts or winter squash) and it transcends any fillet of fish that has been simply cooked in a sauté pan or in the oven. ** I usually buy a bunch of Thai red chilis and I keep them in a ziploc bag in the freezer (they keep for months). I slice one when I need it without even defrosting it first. Combine all the ingredients in a bowl and whisk until combined and sugar has dissolved. Alternatively, you can put everything in a jar and shake until sugar is dissolved. Extra sauce will keep in the fridge for a while. This entry was posted in Recipes and tagged sauce. Bookmark the permalink. this looks amazing and simple. Loves it! Yep, I will give this one a try! Hello. I’m glad you are enjoying the blog. At this point I do not use Twitter but if I do in the future, I will post about it right here on the blog.